Middle Knoll01263 715779work01603 870304fax Self-cateringThs romantic retreat is tastefully furnished with quality furninshing. There is a super king Feather and Black bed with crisp linen and large double ended bath in the en suite bathroom. Hidden away in very quite part of popular Cley next the Sea, ideally located for walking and bird watching. • Outdoors: Courtyard garden , barbecue, table and chairs. Stairs are steep with a twist in keeping with age of property and there are changes of level on the ground floor. Middle Knoll offers weekly bookings starting on Friday. Ths romantic retreat is tastefully furnished with quality furninshing. There is a super king Feather and Black bed with crisp linen and large double ended bath in the en suite bathroom. 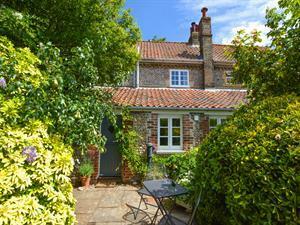 Hidden away in very quite part of popular Cley next the Sea, ideally located for walking and bird watching.